The Standard Workbench Metal Pegboard organizer kit offers over 10.5 Square feet of storage space and an all-steel construction that will not warp, fray or crack. The patented double offset hook engagement improves hook stability securing any variety of tool or job aid and prevents hooks from falling out of their slot when tools are removed. The metal pegboard's attractive, scratch resistant, baked-on powder coat finish wipes clean for long-lasting aesthetic appeal for any shop or work area. Installation is easy and absolutely no framework is required due to the metal pegboard's pre-formed flange which spaces the panel face off of the wall. These metal pegboard panels are magnetic and accept wall control hooks, brackets, and shelves as well as traditional standard 1/4" pegboard pegs. 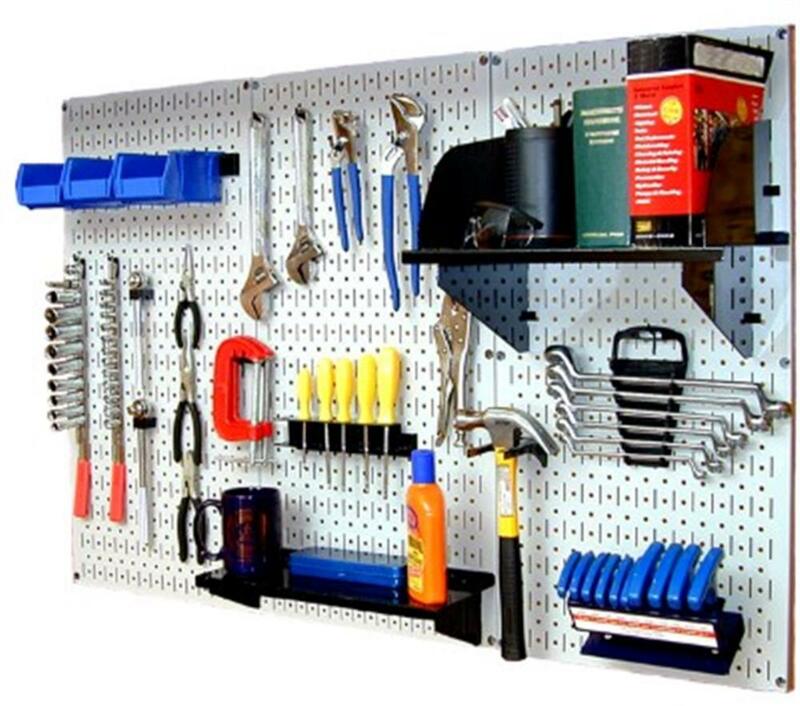 This kit includes: (3) metal pegboard panels 32" x 16" (covers 32" x 48") (1) 9" shelf assembly with shelf dividers (1) 6" shelf assembly (3) plastic bins with bin hanger (1) screwdriver holder assembly (holds 6) (1) hammer bracket (20) assorted hooks and brackets. Mounting hardware is included. Made in USA.